First Berkshire Fleet List: New arrivals by 15th were 60755, 60757 and 60758 which will join 60756 at Slough for routes 41 and 43. 61258 has been allocated to Bracknell instead of Slough as previously reported. New arrivals on 19th were temporary acquisitions 20366, 20367, 20373 and 20374 which are Volvo B7R / Plaxton Profiles from First Cymru Port Talbot depot. Thanks to Mat Wooll for this. The Volvos are for Greenline services, but because they are temporary acquisitions will retain First corporate livery. They replace four Scania Berkhofs which will transfer to the London training fleet replacing Metrobuses. The remaining four Berkhofs look set to follow once replacements can be found. Thanks to Keith Nason for this. Reading Transport Vehicle Types: Total updated to 195 vehicles (131 Reading, 35 Newbury, 29 Goldline), plus: 7 on order. Stagecoach in Oxfordshire and Warwickshire Fleet List: Although now officially allocated to Rugby, 13608 is a spare at Victoria and 13626 remains the spare vehicle at Nuneaton. Thanks to Paul for this. Oxford Bus Company Fleet List: 904 entered service yesterday on the 602 football service (although only to the stadium before the match), presumably because earlier in the week Darts 401-10 were all taken off the road with a chassis defect, and it is not known when they will be able to return to service. 828-34 have all lost their Oxford Abingdon Direct branding in preparation for service changes on 10th December. First Berkshire Fleet List: Registrations for 60754, 60756 and 61258 corrected to N419 ENW, M421 MWY and N417 ENW. Thanks to Grahame Bessey for highlighting this. Stagecoach in Oxfordshire and Warwickshire Fleet List: 31333 is confirmed at Nuneaton. Thanks to Keith Wood for this. Stagecoach in Oxfordshire and Warwickshire Fleet List: 16614/5 have been repainted from into standard livery from Unibus livery. Physical confirmation is required regarding the reported move of 31333 from Leamington to Nuneaton, as it may only be pending. Similarly, despite officially being in reserve 14517 remains in service at Leamington. 52601 is not currently with the fleet, and it is now unclear whether it ever actually was. Thanks to Paul for this. Reading Transport Fleet List: 962 has returned from repaint. Thanks to James Cusworth. Stagecoach in Oxfordshire and Warwickshire Fleet List: 14936 was sold to Ensign (dealer), and has now passed to Freeway Coaches, Derbyshire. Stagecoach in Oxfordshire and Warwickshire Fleet List: Nuneaton 14515, 40143 and 40153 and Rugby 41505 have been withdrawn and put into store at Leamington. 14515 and 41505 are in reserve whilst 40143 and 40153 are for disposal. 14386, 14932, 14944 and 40163 appear to have been sold. 31333 has transferred from Leamington to Nuneaton. Thames Travel Fleet List: Varios 846 and 848 have left the fleet. Seating capacity of 506, 606 and 156 corrected to B29F (from B26F). 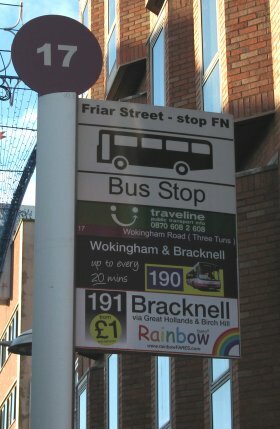 Reading Area Bus Routes: Major changes to evening and NightTrack services from 15th January 2007. First Berkshire Fleet List: 61258 has been allocated to Slough, with another three of the six South Yorkshire examples also to be allocated there, only two will be used at Bracknell. Thanks to Keith Nason for this. Weavaway Travel Fleet List: NBZ 70 / NDZ 70 have been returned to their original marks YN04 WTC/D, and WA03 UDY/Z have gained NBZ 70 / NDZ 70 in their place. Thanks to Derek Bradfield for this. Courtney Coaches Fleet List: A second DAF DB250 / East Lancs Lowlander has been delivered registered YJ56 KCK. Thanks to Derek Bradfield for this. Reading Transport Fleet List: Six new Scania K230UB / Wright Solars are on order for DayTrack, with expected delivery in August 2007. They will replace 731-7 which are to be returned to their leasing company. An MAN ND 243F / East Lancs Kinetic+ demonstrator has been acquired, and will join the double deck fleet in about March 2007 once it has finished its demonstration work. 472 is confirmed as having lost its Directline.com MegaRear in favour of fleet livery. Oxford Bus Company Fleet List: 810 has been refurbished and repainted in City 5 livery. Dart 402 has also been repainted into the new Oxford Bus Company livery. Thanks to Malcolm Crowe for this. Reading Transport Fleet List: 723 and 962 are going to East Lancs for repaint tomorrow. 631 has had its Newbury Buses logos removed, Reading Buses logos placed on the front and a cash vault fitted. It may therefore be about to enter service at Reading. Thanks to Brian Coney for this. First Berkshire Fleet List: Events have not followed the information on the official movement sheets reported on 2nd. 64819 remains in service along with 64811/5. 64819 was always meant to be staying along with 64810/7 due to advertising liveries. 64815/8 had returned to Bracknell last night, presumably returned from loan. New arrivals from South Yorkshire are Scania L113CRL 61258, 60754, 60756 with three more expected shortly. Thanks to Mat Wooll for this. Reading Transport Fleet List: Scania 12 arrived at Reading yesterday, and should enter service in Newbury in about a weeks time. Reading Transport MegaRears: 474/6 (and probably 472) have lost their MegaRears for Directline.com, 474 in favour of fleet livery, and 476 for a new rear for Ikea. These were presumably done during in October along with previously reported 475. New photos of the rears on 475 and 476 added. Reading Transport Optare Solos: 121 is confirmed as having lost its Vodafone logos last week, but 120 still retains them. Reading Transport Optare MetroRiders After RTL: New photo of 621 with Arriva added. Thanks to Neil Wise for this. First Berkshire Fleet List: 64819 has been withdrawn and has gone into storage at Hayes along with 60295 and 64816. Meanwhile 64818 been withdrawn and has gone with 64812/4 on loan to Hampshire. Thanks to Mat Wooll for this. Reading Transport Optare Solos: 120 did not loose its Vodafone logos or rear advert by 27th as previously reported. 123 was also in service in the new livery by this date. Thanks to John Wheeler for this. The exact livery status of 120 and 121 needs confirming.